Has the Greek crisis taken on a decidedly sub-prime feel following revelations that Wall Street investment banks earned hundreds of millions of dollars over the past decade from transactions that helped the country mask billions of dollars of debt? Apparently Greece wasn’t the only EU government to use these types of deals, where a government would raise cash up front in exchange for handing over the rights to future income streams, to hide the extent of their budget deficit(s) and national debt. Such schemes were also popular in some of the other PIIGS countries. Greece remains the main subject of discussion for EU finance ministers currently meeting in Brussels. The EU appears to have slept through the Greek use of accounting tricks to hide their deficits and is presently engaged in a good deal of collective self-recrimination for not paying closer attention to the true state of Greece’s dismal public finances much earlier. As a result, the EU is to send teams of experts from the European commission, the European Central Bank and the International Monetary Fund to police the Greek austerity programme and rule whether the package will achieve its aims. The meeting in Brussels was dominated by working out how the unprecedented policing regime would work. Brussels based European Union regulators have ordered Greece to disclose details of complex derivative currency swaps after an inquiry by the Greek Finance Ministry uncovered a series of agreements with banks that may have been used to conceal mounting debts. The swaps were employed to defer interest payments by several years, according to a February report commissioned by the Finance Ministry in Athens that is being examined by lawmakers. "While swaps should be strictly limited to those that lead to a permanent reduction in interest spending, some of these agreements have been made to move interest from the present year to the future, with long-term damage to the Greek state," according to the Greek Finance Ministry report. Greece's burgeoning budget deficit caused it to fail the criteria for joining the single European currency in 1999. Member nations had to reduce deficits to less than 3% of GDP and trim national debt to less than 60% of GDP to join. As a result, it joined the euro in 2001. How did it manage to do that? Shortly after Greece joined Europe’s monetary union, Wall Street investment banks helped the government quietly raise billions of dollars without immediate visible impact. Athens was thus enabled to continue its free-spending ways while appearing to comply with the strict EU deficit regime, because the currency trades took the form of complex derivatives transactions rather than loans. The New York Times recently reported: Goldman Sachs made about USD 300 million from a swaps agreement with Greece. The firm's bankers, including President Gary Cohn, travelled to Athens in November 2009 to pitch a deal that would push debt from the country’s health-care services into the future. Greece apparently rejected the offer. George Papaconstantinou, the Greek finance minister, has said that the role played by investment banks such as Goldman Sachs and JP Morgan in striking derivatives deals with the Greek government intended to conceal the true state of the public accounts was not unique to Athens. "Greece was not the only country using them [derivatives]." The revelation that Greece participated in such Wall Street transactions has further undermined its credibility within the EU. Greece had already been criticised by the EU for supplying incorrect information about its budget situation in the past. Standard & Poor’s and Fitch Ratings have just begun questioning the Greek government over its use of the swaps. The rating agencies are doing the right thing, but it may be too little too late. S&P, Moody’s and Fitch all cut Greece’s credit rating in December 2009.
. Moody’s cut Greece to A2 from A1. Greek officials last month pledged to provide more reliable statistics after the EU complained of “severe irregularities” in the nation’s economic figures. 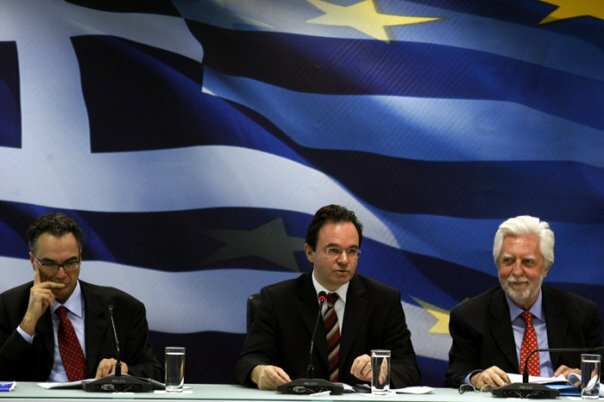 The Greek Finance Ministry report blamed “political interference” for the collapse of credibility in Greece’s statistics. There were “serious weaknesses” in data collection, especially with spending figures, as information often came from second-hand sources, the report found. Eurostat, the EU statistics office, has given Greece until the end of the month to provide more information on the swaps. Greek Finance Minister George Papaconstantinou visiting Brussels has said the country’s use of swaps agreements was legal at the time. He also said the contracts are no longer legal and Greece has stopped using them. After meeting in Brussels last week, EU political heads pledged to support Greece, but they failed to detail what measures they might adopt to rescue the debt-burdened country. EU finance ministers resolved to keep Greece under unprecedented surveillance as the country attempted to slash its budget deficit from its present level of 13 per cent of GDP to less than 3 per cent by 2012. EU finance ministers have also discussed the type of financial assistance they could theoretically provide to Greece, such as direct loans, guarantees of the country’s debt, and purchasing Greek government bonds. Volcker Wissing, finance committee chief in Germany's Bundestag, called the Greece swap deals a grave breach of trust. The Greek efforts to mask the size of their debt may make it less likely that the Bundestag will be willing to endorse a debt guarantee or loan package for Greece. Michael Meister, financial affairs spokesman for German Chancellor Angela Merkel’s Christian Democrats, states: “Goldman Sachs broke the spirit of the Maastricht Treaty, though it is not certain it broke the law. What is certain is that we must never leave this kind of thing lurking in the shadows again.” Chancellor Merkel's party within the German government coalition aims to push for new rules that will force euro-region nations and banks to disclose bond swaps that have an impact on public finances. Germany's Constitutional Court has already issued rulings that prohibit -– or complicate –- any bail-out for EMU states. German opinion polls suggest that any PIIGS bailout would be equivalent to suicide for the coalition government. The problem for Greece is that it now finds itself under extreme pressure to cut its budget deficit by slashing spending and boosting its revenues. EU leaders last week pressed Greece to get its deficit under control and vowed “determined” action to staunch the worst crisis in the euro’s 11-year history. But the result of these past deals with Wall Street banks is that the Greek government has already handed over the rights to big chunks of its revenues, such as airport fees and lottery proceeds, for years to come. Greek Prime Minister George Papandreou more than tripled the 2009 deficit estimate to 12.7 percent after ousting two-term incumbent Kostas Karamanlis in October. Is the EU incubating a "deflationary shock" for all of Europe by forcing PIIGS nations to tighten fiscal policy in the middle of The Great Unwind and The Great Reset without enough monetary stimulus to offset the effect? Do distinguished ATCA members detect an unfolding eerie parallel with the early 1930s?